As with the other rubbers from the series, ACUDA S3 produces excellent spin. The very soft sponge increases feel and sound, and offers sufficient speed for powerful spin and a positive block game. 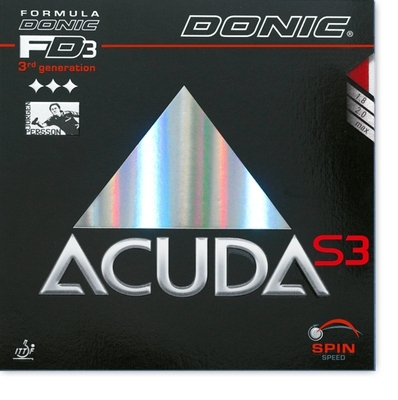 Playing with DONIC ACUDA S3 will guarantee success and pleasure. It has a unique sound! Sponge hardness: soft Playing characteristics: spin-optimized, fast, paired with perfect sound. Recommended for: Spin and allround players who require excellent control. pimple in, Spin 10++, Speed 9-, Control 7+, sponge soft, surface spin elastic. Topspin highly recommend this rubber for players who like to play with soft rubbers with spin and feeling.